I’ve been forced by snow & sickness lately to lean into our more home-centered winter routine. Most of the year we’re outside a lot of the day, and it’s been a challenge to keep Lucy & Catalina occupied without fighting or (much) TV for the extra hours we’re inside. We’ve had bouts of cabin fever for sure. 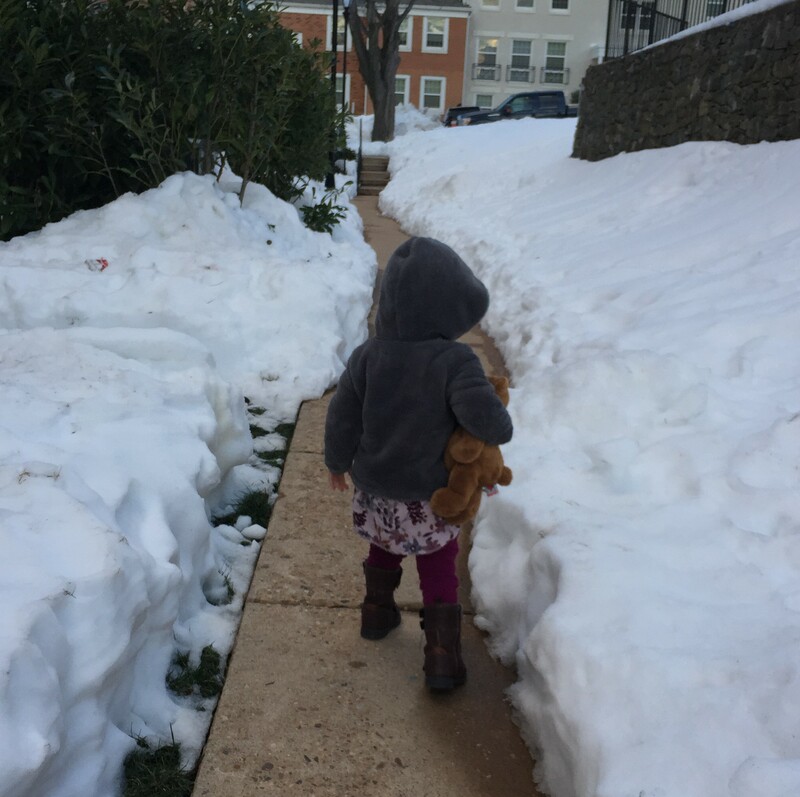 But, inspired by Amanda’s thoughtful post at Homesong, I’m remembering how to embrace winter and many hours indoors. And like her, I love a glimpse inside others’ daily lives. So, here’s a little glimpse into ours. Maybe your days look similar– maybe they’re super different, and I’d enjoy hearing about yours, too. Most days I try to wake up a little before everyone else to do some reading and get in a got cup of coffee. When Bryant’s home he gets up with the girls; morning is their time together and I can sneak to our bedroom for a few extra minutes while they play. We start breakfast around 7:15 as Bryant is dashing out the door. Lately they beg for oatmeal and end up eating my eggs, but they must have oatmeal to start. Once they’re settled, I alternate bites of eggs with unloading the dishwasher until they’re finished, then buy more time with some music and having them clean their trays. After breakfast is when, in warmer weather, we’d go for a run or walk to the park. On windy or rainy days, we settle for tea parties by the window. But if we’re going somewhere, this is the time. I can usually get them to build with blocks long enough to get myself ready for our weekly grocery trip, or to the library or mall play area. Otherwise, we fill the time making messes & building block towers. I’m discovering how much our active summer routine allows me to skim over focused-attention activities; winter playtime has taught me better to really sit and talk with them about their toys, the colors and shapes, and make up stories about what we’re doing. Lunchtime is soup time. We’ve been loving a tomato soup similar to this one, with ground turkey added in. It makes a big batch I can throw in the slow cooker for several days of leftovers. I heave a big sigh of relief once they’re sleeping. (Or babbling from their beds, like today. And the day before. And the day before.) While they sleep, I clean the kitchen, keep laundry going, and read or write. I also try to do barre a few times a week. I always think I’ll do it during nap time, but usually end up starting in the afternoon as a way to entertain the girls and finish once they’re in bed. We make it through approximately 8.5 minutes before they’re over it, but it’s amazing how much more incentive I have to finish after their bedtime if I start while I have energy. In the afternoon, we usually hang around home. This is when it gets challenging, especially if we’ve been home all morning too. One can only build so many block towers and read Green Eggs and Ham so many times. If we’re lucky, it’s warm & dry enough to walk to the playground for a few minutes. We pull out pots and pans and fill them either with water, or with pasta, beans or oatmeal. Either way, it ends in bath time– our favorite. While they splash I clean the bathroom, then read a book and keep them from dunking each other. With luck this lasts til dinner time, or we fill up the cozy after-bath time with books again. They eat dinner around 5:30, while I tidy the kitchen and finish mine & Bryant’s dinner. My absolute favorite last-minute dinners are Shakshuka (use canned tomato sauce and a touch of harissa) and Greek Lemon Chicken Soup, which can both be made so quickly that two screaming, clingy toddlers will be happily eating before you join the screaming. Bedtime has become almost comically drawn out. Once jammies are on, each of them must have their sheep and puppy and their water cup. Then we snuggle on their lion pillow for several minutes. Then we read Llama Llama Nighty Night three times. Then we sing goodnight songs in the rocking chair. Finally we turn out the lights together and they’re in bed around 7 p.m. Since our apartment looks like a hurricane of toys and cheerios hit us daily, I get it as clean as I can before Bryant is home for dinner. That way all I have to do after dinner is finish tidying the kitchen, fold laundry and vacuum if needed. One of my New Year’s resolutions is learning to tidy as we go through our day. I’ve always been one to make the messes and then do all the cleaning at once, not realizing how much time I can save over the course of a day by putting away a towel here and a few legos there. Sometimes I still feel like the mess overtakes my evening, but it happens less than it used to and I’m thankful. If you’ve made it to the end of this day-in-the-life novel, congratulations! I would love to hear what your winter rhythm is like. You’ve inspired me; I’m totally going to write a “winter rhythm” post too. 🙂 Question: do you have a regular cartoon time, or that just for the extra stir-crazy days? I still debate (daily) whether I should wean my boys off their post-nap afternoon Netflix time. We don’t do regular cartoon time right now, but when they went from two naps to one, we did while we all adjusted. I think it totally depends on the season and right now we don’t need it, but I am sure we will again. Pingback: The winter rhythm of our house. | notes "just so"